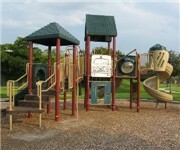 A nice little playground in Rossi Waterfront Park, near Manatee River and downtown Bradenton. How Would You Rate Rossi Waterfont Park? Nice size playground inside Coquina Key park.